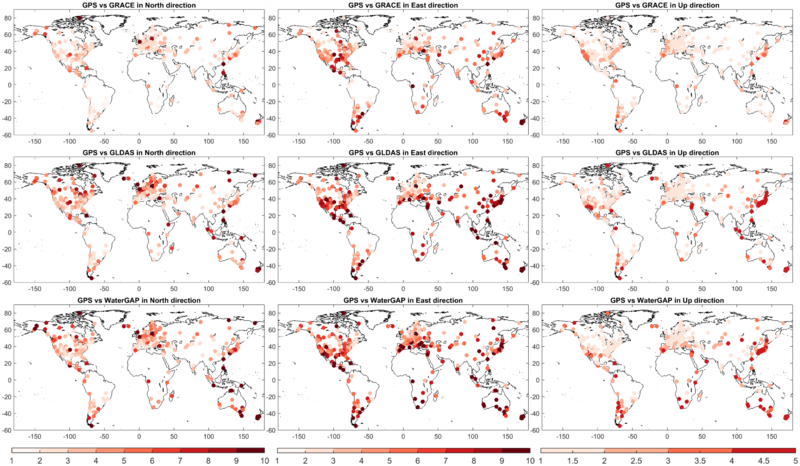 Time series of TWSA grids as simulated by a number of WaterGAP model variants that were subjected to different C/DA variants are being used by P9 for simulating surface displacements. These displacements are then compared to geodetic observations (GNSS 3-dimensional surface displacements) in the training and critical regions as well as in the validation regions of WP4.3. In addition, TWSA simulated by WaterGAP without C/DA will be validated globally. The resulting measure of fit between observed and simulated displacements are interpreted in this WP with respect to the performance of C/DA. In the regional analyses where there is sufficient GNSS data, we will use the observations to invert for the water storage itself. A goal of this project will be to precisely quantify the errors in the GNSS observations and the theory to generate the displacements. The goal of this project is to quantify our confidence in the various versions of WaterGAP through a comparison of its estimates of water storage with GNSS observations. The 3-dimensional coordinates allow us to compare the model versions in terms of both the amplitude and the spatial distribution of the water storage. Uncertainty quantification, and sensitivity will be a particular challenge in this respect. GPS errors may be known but quantifying them is extremely difficult. Figure: The RMS ratios between the GPS displacements and GRACE-, GLDAS-, and WaterGAP-derived displacements (L. Wang, 2016).